Just starting this thread about Season Ticket prices for 2018-2019 with a prediction. This thread will evolve into the most viscous, sweary, aggressive and anti-club thread ever...... good luck everybody! Price increase of existing seat allocations is an acceptable fact of success and economics (inflation etc.). The problem with the latest proposal is for a complete change in seat designations (gold to platinum etc.) without any discussion with the customer! Surely this is unacceptable in any "contract" arrangement? Quite agree,if this is what is going to happen, I think it's just another way of introducing a huge rise in prices and disguising it by changing seat designations.My seat hasn't changed position, it's in the same place it always has been,but there is a huge rise in cost.We're constantly told how important we are to the club, well it's a b****y funny way of showing it. Second time it's happened to us silver became gold and discount didn't apply now silver becomes gold again unless another sideways move. Any further and I'll be in the car park so I won't renew and stay at home saving money, grief and being ignored. Hardly the 'ethic' proposed by Saracens per se. I have every sympathy with those who feel ambushed by these increases; there does seem to be an element of subterfuge from the Club here. I downgraded from Silver East stand to Red/Black East Standing the last time there were big price increases. At AzP I stopped buying programmes, food, cut down on the beer and I rarely buy anything from the club shop. I eat outside the ground and buy a 35cl bottle of Waitrose own brand whiskey instead. I do like the Wolfpack bus but the Olympic Bar is too busy now. With the money I've saved I acquired membership of Middlesex County Cricket Club. That is now only costing me £245 per annum and the facilities at Lords are second to none. It is something I always meant to do but somehow never got round to it before. It has the value that my Saracens season tickets once had. Great idea Coughie but Canterbury would be my preferred destination! Edited 1 time(s). Last edit at 10/04/2018 06:43 by Highbury Saracen. I dont really see what the point of this thread was. People are allowed to express an opinion and to be upset if they are subject to massive inflation busting price increases. I also think from the clubs point of view it could be a bit of an own goal. We all know they need to reach profitability, but the way to achieve that is surely to get bums on seats, spending money at the bar, in the shop etc and hopefully to end up with a waiting list for season tickets. That would then be the time to creep the prices up or a modest stadium size expansion. I also agree with others that there is a right and wrong way to raise ticket prices. To me it is just another indication in how much the quality of communication from the club has dropped since Edward left. Its like this thread is in its own little bubble. We were all worried (well I was) last week about the fact that our SA shareholder withdrew his support for the club. Many expressed a desire for the club to break even also. The salary cap has increased and I am sure Nigel and the other shareholders have also had to dig deep to support this. If we are selling out the ground for nearly all the 1st team games and the bar tills are ringing how do people think that the club will raise revenue to meet the shortfall? Its your personal decision as to whether you go with the rises or opt out and downgrade or stop coming. The seats at the ground are a commodity that the club need to gain the maximum revenue that their customers can stand. I will wait to see what the rises are as I appreciate our success comes at a cost that we all have to share. Match day revenue is never going to be enough for club to break even no matter how much they rinse u. It has to be the peripheral uses of the hospitality to earn revenue daily. I bet no other clubs ‘gold’ seats are in line with try line or platinum seats out in rain!!! Interesting point. Does anyone have comparable seat pricing from other clubs? 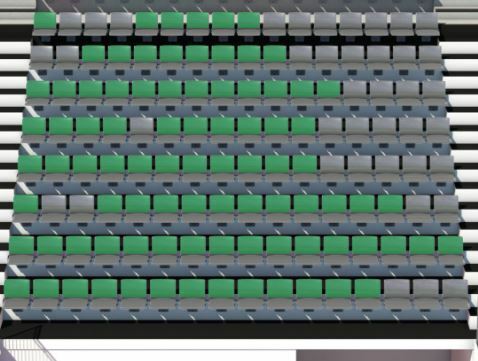 My seat in E2 looks to be upgraded to Gold from Silver taking the price to around £700 per year. The pricing is now getting to a stage where it is a million miles away from some of the cheaper season tickets at PL football for less games and not forgetting 2 games that are played 'away' (Double Header if it's a home match and the Wembley/London Stadium game) where the seats and atmosphere are invariably sh!tter than at AP. I've been informed that sales in the East Stand are poor resulting in swathes of empty seats. Does anyone have any verifiable figures? Looking on Saracens website looks like around 50% have been sold. That is the stand that you can see on TV. Terrible terrible optics for the club and entirely of their own making. My old Manor - Lower E4 is looking very sadly undersold right now ! Ah look Waldo, there's my old seat,Pete is probably still there, but peering over like Kilroy.